If I were to make the claim, prior to the American Civil War, that to wish for an end to slavery in America, was monstrous, because its downfall would entail the suffering of millions of white southerners, who would become jobless and hungry, some may have been so inclined to call me a monster. My point here is not to compare the degree of suffering that may or may not happen to us soon, to the suffering that may or may not have happened in the Confederate states, had they ended slavery, but to illuminate the actual reality, rather than the perceived reality most of us know. Some believe, that it is monstrous to wish an end to civilisation. I have highlighted some of the current atrocities being committed today, in previous posts, here, and here. The next few posts will examine even more of the monstrous activities our civilisation is engaged in. This is an effort to give credence to the notion that our culture is doomed, and the sooner it ends, the better. And furthermore, to dispel the illusion that this way of reasoning is “monstrous”. Exceptionally large; enormous: a monstrous tidal wave. Deviating greatly from the norm in appearance or structure; abnormal. Of or resembling a fabulous monster. Major power companies and the current White House administration are telling Americans that coal is the future of affordable energy. But increased greenhouse gas emissions, dangerous coal mining, mercury pollution, increased asthma and human health problems, and dramatic groundwater waste are costs that no one can afford. Tell the CEOs of power companies Peabody and Dominion and their Board members to heed the call of shareholders and their power customers and halt climate change, stop building new coal plants, and shift the billions of dollars they are spending on coal into green energy like solar and wind as well as energy efficiency. This is why, despite the optimism of some energy experts, the electricity grid will be more and more difficult to maintain, as oil prices climb, and the effects of peak oil set in. The amount of money needed to continue to build giant earth movers is going to dry up, because no company in the world is going to invest in electricity generation when their is no return on investment, we are already in that position now. This is evidenced by the massive number of mergers among power companies, like Constellation Energy of Baltimore recently purchasing FPL of Florida. This illustrates the monstrous nature of our electricity production, and the inevitability of its demise. It should also be duly noted that in medieval times, coal was considered an extremely poor source of energy, because it turned the skies black. Europeans only came back to coal after they exhausted the wood supply in surrounding forests. So much for the wonders of technological progress. The tar sands in Alberta are often coveted as the “solution” to peak oil. Without devolving into an “alternatives” discussion, here is a photo essay from “Technology Review”. Where the oil sands lie close to the surface, mostly near the town of Fort McMurray in Alberta, they can be mined. In the effort to get at these sands, areas have been drained of wetlands and stripped of boreal forests, which play an important role in climate regulation and carbon storage. Their destruction contributes to the greenhouse effect. Equipment used by oil-sand miners includes tractors with top-mounted radiators and cooling fans to protect their engines from oil particles and sludge, thousand-metric-ton shovels, and the Caterpillar 797. 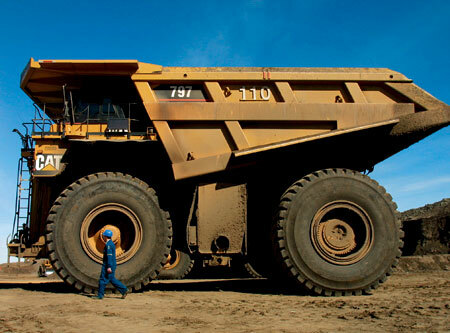 This colossal dump truck weighs more than 500 metric tons when empty. When its tires wear out after about a year, they are reused as cattle feeders. 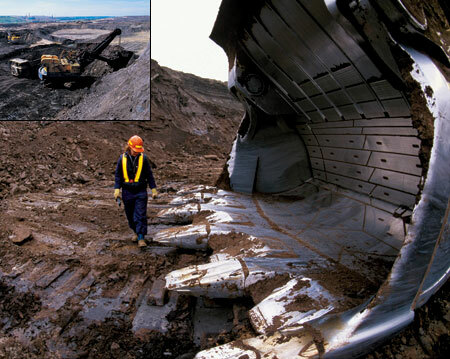 Producing crude oil from the Alberta sands is an energy-­intensive process. 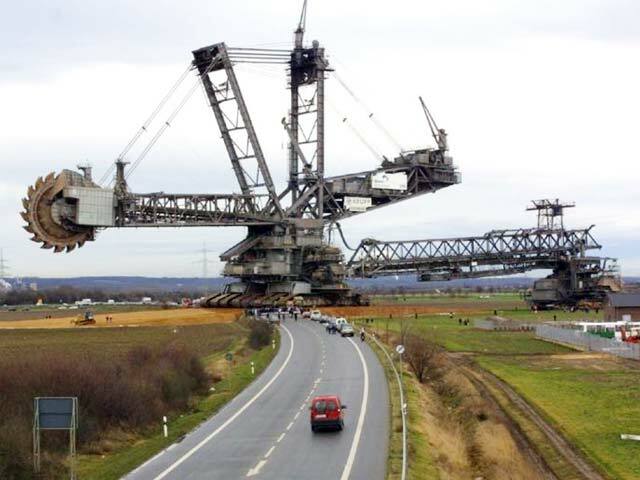 Giant digging and transportation machines use commensurately large amounts of fuel. Refining and welling technologies consume roughly 300 cubic meters of natural gas per barrel of recovered oil. Environmental watchdogs estimate that, as a result, producing a barrel of oil from the Alberta sands releases two to three times the volume of greenhouse gases that traditional oil production would. By 2015, production from the oil sands is projected to release 94 megatons of greenhouse gases. Oil sand retrieved from surface mining is crushed and then moved to a processing plant via “hydrotransport.” As the sand, mixed with water, tumbles through transport pipes, the clumps of bitumen, sand, and water begin to loosen. The sand-and-water slurry is dumped into tanks with hot water, where it separates into three layers: sand, bitumen froth (impure bitumen), and a middle layer that is further treated to extract bitumen. 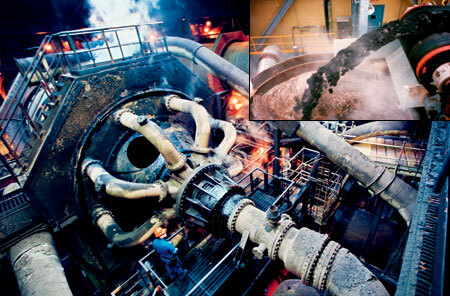 Bitumen froth is also treated to remove impurities. 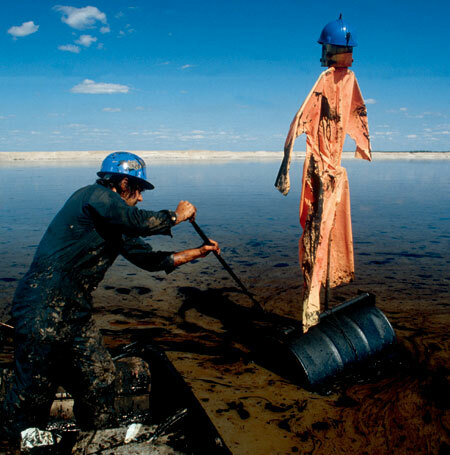 Oil companies create ponds in which to dump millions of cubic meters of the sandy, toxic by-product of oil-sand processing. These “tailings ponds” are characterized by salt and acids. Here, a worker installs a scarecrow to keep birds away. I would qualify this, along with the giant earth mover, as “Beyond Monstrous“. Cooling fans and blowers are essential to systems that produce a significant amount of heat like computers and other electronic components. Different systems are engineered to work with specific types of fans. Cooling fans come in all shapes and sizes as well as voltage, airflow, and case size..
Well I am adding this RSS to my email and can look out for much more of your respective interesting content. Ensure that you update this again soon.. Thanks for the vote of confidence. I plan on updating much more in the future so please come back soon!